Buying a new car is a big decision. Not so much the make and model, but more about the financial responsibility that comes with it. Unfortunately, what we want and what we need are often at odds with each other, and car buyers end up purchasing a vehicle with a price tag that exceeds their budget…and then some. You may have purchased a pair of Manolo Blahnik shoes that were more than a month’s rent, or a new, state-of-the-art gaming system that set you back a few bills, but those splurges can be contained and could be considered short-term lapses in smart financial judgment. They busted your budget, but over the next few grueling months, you can probably get back on track by skipping your daily Starbuck’s run, clearing your calendar, and eating ramen noodles. Purchasing a car that’s too expensive for your wallet could possibly tie-up your finances for the next 60 months. That’s five years of monthly payments that you may or may not be able to consistently afford. The golden rule of car buying is to NEVER ignore the total price of the car. Regardless of how they package the financing, it won’t change the actual cost. Consider purchasing a vehicle that’s below your means, unless of course, what you’re driving means more to you than your financial sanity. Ask most car salespeople and they’re likely to say that the percentage of buyers who put down a substantial down payment is pretty low. Whether you fund it with a trade-in or cash that you’ve been saving, a down payment will lower the amount of money you’ll have to pay over time. It’ll decrease your monthly loan payment and hopefully, bring it in line with your budget. Make a list of your “must have” and “nice to have” options before you visit the dealership. Everyone wants the newest and coolest features, and for just a few hundred or a couple thousand more dollars, you can have it all…heated seats, parking assist, wi-fi, keyless entry, and a navigation system. Yeah, they’re nice to have, but here’s where you have to determine what you need and what you want because it all leads back to the golden rule. Don’t trade one financial problem for another. For the people who get tired of their cars after a few years or feel the need to upgrade their ride every other model year, the idea of holding onto their vehicle until the loan is repaid seems preposterous. To keep themselves in a new car and avoid any down payment, they simply roll one purchase into the next. The deficiency on their current car, because it was worth less than they owed, is added to the new car loan. It’s an ugly cycle that is truly detrimental to your financial health. Another thing to consider beyond the price of the car is insurance, repair, and maintenance costs. Generally, the more pricey the car, the more expensive it is to insure and take care of. Talk with your insurance agent to determine how much your monthly insurance premium will increase. Research costs so you’re able to plan for routine maintenance and repairs. Some of the results might lead you away from certain makes and models and toward more reasonably priced alternatives. 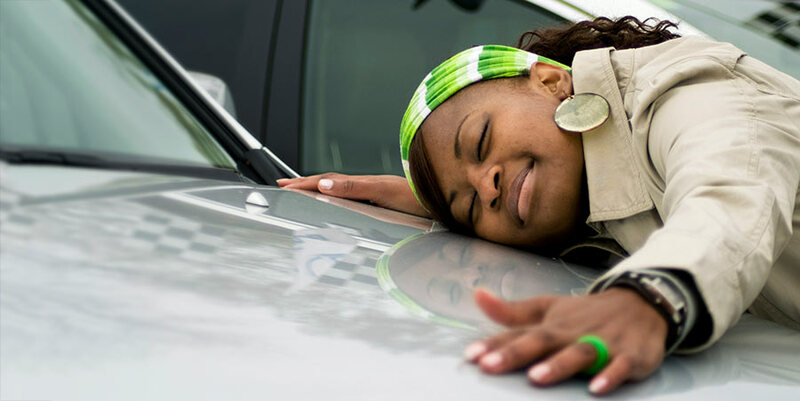 Hopefully, these tips will keep your next car purchase from wreaking havoc on your finances. Do your research, consider your budget, and keep your emotions in check. Remember, the decision to buy a car isn’t a “one day and it’s done” choice. It’ll impact the way you manage your financial life for years…and that’s a long time to eat ramen noodles. Are you in the market for a new car? Some people love car shopping and like to think they know all the secrets to getting the best deal. Mention that you’re even thinking about buying a car, and they’ll grab your ear for the next hour telling you about every car they’ve bought and sold over the last 20 years. Heck, they might even offer to go to the dealership with you just to show you how it’s done. Many think that dressing poorly when you enter the dealership leads the salesperson to believe you don’t have a ton of money. To sell a car, they’ll need to give you a bigger discount. Not true. People come in all shapes and sizes…and grooming habits. Regardless of what you’re wearing, the dealership will ultimately run a credit report, the true picture of your financial standing and credit worthiness. Showering and dressing in your normal casual attire is your best bet. That way, no one will be afraid to get too close. It’s the same thing with coupons, right? You’ll jack up the price so when I pull out my discount, you’ll already have a cushion. Wrong. Why do you think some car dealerships will buy your trade-in even if you don’t buy their new car? Trade-ins make money. In fact, your trade-in, depending on popularity, supply, and demand, may be worth more than you think to the dealer. It’s also more likely that you’ll be able to afford that new car, so the dealer has incentive to offer you the best price. If you spring your trade-in at the last minute, the salesperson will have to go back and rework all the calculations and paperwork he’s completed so far, a complete waste of time. You’ll also know what the dealer is offering for your trade-in, which will help you decide whether to accept the offer or to sell it privately. No matter what, though, be sure to check the Kelly Blue Book value, so you have a ballpark idea of a fair price. Yikes! What kind of math is that? Just because you can afford a monthly payment, doesn’t mean it’s a wise purchase. Consider this: Your new car depreciates as soon as you drive it off the lot, but for the next 5 or 6 years, you’ll be paying the same hefty payment each month. Plan to trade it in in a year or two? You might be upside down and owe more money than it’s worth. In addition, you’ll need to consider what will change in your future finances. Will you be buying a home, raising a family, paying for college, or facing unemployment? The financial decisions you make now will impact you in years to come. You’ve found your dream car. It has every upgrade you wanted, the perfect color, and it’s the only one on the lot. Grab it and run! No, wait. STOP—and come to your senses. There is more than one dealership and, chances are, there are other cars that will make you feel all warm and fuzzy inside. If not, a dealership can always factory order one. A hasty decision can have tragic financial consequences. If a salesperson uses the “buy it before it’s gone” tactic, it’s only because he’s trying to nail down a sale. Don’t fall prey. Take the time to do your research and price comparisons. Who says a new car is the only way to go? It’s likely your very vocal co-worker who bought a car from Bob’s used car lot and got stuck with a lemon, or maybe it’s your Uncle Fred who bought his last car in 1975. It happens, but considering your new car loses between $3,000 and $5,000 once you drive down the road, you might want to reconsider. Pre-owned cars are big business in today’s market, especially with the number of drivers who opt for car leases that expire after three years, on average. Other inventory may be the result of fickle car owners and their desire to have the latest and greatest features and model. There are some advantages to pre-owned cars, especially when you purchase through a reputable dealer. With limited miles and a few years under its belt, all the kinks have been worked out, and the dealership has likely put it through a 100-point check. Some may still be under the manufacturer’s original warranty. When you’re purchasing a car, you’re in the driver’s seat. Do your homework, take your time, and don’t be pressured into something that doesn’t meet your needs or satisfies your comfort level. Everyone will give you their two cents because, well, they want to help. Take it for what it’s worth, but don’t base your decision on someone else’s experience. If you’ve ever purchased a vehicle, you’re probably familiar with the same old spiel – the finance guy (or gal) at the dealership sits you down and begins offering you product after product to protect your interest, and if you’re like most people, you end up feeling overwhelmed and confused. So, the question is, what are ancillary products and are they really worth it? Ultimately that decision is up to you, but we’ve highlighted some features and benefits about different loan protection options to help you make an educated choice the next time you’re faced with the decision to add ancillary products. Check them out below. GAP insurance (or Guaranteed Asset Protection) is protection offered by finance companies, either through a dealership or through your credit union, to cover any difference on your loan (that your insurance doesn’t pay) if your vehicle is totaled and/or stolen. The cost of GAP can range from $300 to as much as $900 depending on where you purchase this coverage (e.g., through a credit union versus a dealership). If you are upside down (meaning you owe more than the vehicle is worth), GAP can be a huge money-saver. For a relatively small investment of $300 (competitively priced GAP), you could save thousands down the road. On the other hand, if you end up paying $900 (on the higher end of GAP coverage), your margin of savings will be much less. The key is knowing your Loan-to-Value (LTV). LTV is a percentage based on the amount you owe divided by the value of your vehicle. Example: if you owe $20,000 on your vehicle, but it’s worth $15,000, your LTV is 133%. Generally speaking, if you are over 90% LTV, you could benefit from GAP coverage. On average cars depreciate roughly 19% in the first year, and as much as 50% in the first 3 years – unless you plan on paying off your car in 3 years, GAP could be a huge money saver. Another factor to consider is some GAP policies will also pay your insurance deductible, so instead of paying $500 or $1,000 or higher (depending on your deductible), you pay nothing out-of-pocket. Mechanical Repair Coverage or extended warranties are offered in addition to the manufacturer warranty. The cost of extended warranties varies greatly depending on the make and the model of the vehicle, and who you purchase the extended warranty through. How many years/miles does my manufacturer warranty have left on it? Most manufacturers offer a 3-year/36,000-mile factory warranty. What is the difference between the basic manufacturer warranty and the powertrain warranty? The basic warranty typically covers everything bumper-to-bumper, whereas the powertrain warranty only covers the powertrain and the associated parts. How long do I intend to keep the vehicle? How much will repairs cost if I encounter them down the road? Most extended warranties cover you well over 100,000 miles – if you plan on keeping your car for longer than that, an extended warranty could be a great money-saving option. Some institutions will allow you to extend the term of your loan in order to absorb the cost of coverage while keeping your monthly payment the same. Of course, doing initial calculations and analyzing your budget and needs is necessary before making any financial decision. Loan Protection is just like it sounds: protection that covers your payments or the entire loan balance following a significant life event, such as loss of life, unemployment, disability, and family medical leave. Some institutions, such as Georgia’s Own, provide additional protection for accidental dismemberment, terminal illness, hospitalization, and loss of life of a non-protected dependent. * The cost and coverage vary from institution to institution, so it would be wise to do your homework. Most institutions have a cost per hundred dollars of the current loan balance. The events covered by most loan protection programs are: loss of life, disability, unemployment, and family leave. Most institutions offer various loan protection packages that can cover one, two, three, or all four of the life events mentioned. Some institutions offer additional coverage. Loan protection programs are available for most types of loans. There is typically a cap of coverage over a certain dollar amount. Loss of Life protection can ease the burden on your family, and your debt can be completely cancelled. Disability protection could cover your payments for you when your income might be drastically reduced due to a disability event (most competitive employers only offer as much as 60% of your salary for a short-term disability). Unemployment protection could be invaluable in a time where you’ve lost your job unexpectedly and are unable to make your loan payments. If you are unable to work for an extended period of time, family leave coverage can help you maintain the same level of income. The bottom line: There are a number of loan protection options available to help protect you when faced with the unexpected. Although these services come with a cost, it may be worth investing in the peace of mind these protection programs offer. *Beginning August 1, 2017, Life Protection under Members Protection Plus will include even more. We’ve added accidental dismemberment, terminal illness, hospitalization, family medical leave, and loss of life of a non-protected dependent to our coverage. If you’re walking into a dealership before researching your auto financing options, you’re already at a disadvantage. Like the price of a car, interest rates are negotiable and depend heavily upon your credit rating. Understanding your options— and in some cases having a check in hand — puts you in control of the transaction from the beginning. It demonstrates the fact that you’ve done your homework, you’re a serious buyer, and you’re ready to make a purchase. There are several different avenues you could take when trying to secure the funds to purchase a car. You could pay cash, borrow from family, finance it through the dealership, a bank or a credit union. Let’s look at all of your choices and see which one might be the wisest choice for your individual situation. It’s difficult to see the entire cost of a car disappear from your bank account, but think about this: when you pay with cash, you’ll actually limit the amount of money you’ll spend on a car. With financing, you’re not overly concerned with the final cost, within reason, so you tend to overspend because it’s not coming out of your bank account at one time. If you’re paying cash, you have a hard stop and have to prioritize what’s important to you. Cash avoids a monthly payment and saves you the additional cost of five years of interest. Best of all, a cash purchase will likely allow you to negotiate a better purchase price. Borrowing money from family or friends sounds may be a smart option, especially if your credit score has fallen on hard times. The people closest to you may be more willing to help than a bank, in this case. Problems may arise, however, if the loan payments are not made on time or are unable to be made at some point in the future so be sure to plan for those scenarios. Draw up formal documentation with loan repayment dates, interest charges, and a detailed plan for defaults. The loan should be viewed with the same importance as any other financial obligation. A bank can offer some competitive rates in financing a car loan, especially if you have a higher-than-average credit rating. While the bank is an especially convenient option—multiple branch locations, close to home, online account management— banks tend to have very conservative loan policies and can be very choosy about whom they offer their best rates. Some banks offer a discounted interest rate if you have other banking products through the same bank. For example, many offer a .25% interest rate discount if you agree to automatic bill pay for your car payment each month. Credit Unions and banks have similar loan processes, but you may have a better chance of getting approval if your credit isn’t exactly stellar. Credit unions are more apt to listen to your individual situation and make adjustments as they see fit. Interest rates are comparable and they offer a more personalized, relationship-based service. Credit unions work hard to provide a very high level of customer service. Talk to a dedicated professional openly and honestly about your financial situation, flexible repayment plans and any other concerns you may have about your potential loan. The credit union is truly working with your best interest in mind. Most credit unions offer an educational and resources center with information on the different types of finance options, among other topics, and how to make the best decision possible. According to the Consumer Financial Protection Bureau, “when consumers finance an automobile purchase from an auto dealership, the dealer often facilitates indirect financing through a third party lender.” The dealership generally offers you a higher interest rate than the bank or credit union would in order to make money from the loan. This is typically called the “dealer markup” and it can make the loan very expensive. Yes, a loan from the dealership is quick and convenient, but it’s likely the most expensive auto loan option you’ll have. If you’ve done your homework and you’re up for a challenge, you may be able to negotiate the initial interest rate offer from the dealership, so be sure you come prepared! Should you be more concerned with the purchase price or monthly payment when buying a car? Ask ten people and the answers will most likely be split right down the middle. From a financial perspective, however, it’s smarter to negotiate based on the purchase price of the vehicle. The amount of the monthly payment can be sliced and diced any number of ways, but it all adds up to one number in the end. Why focus on the purchase price vs monthly payment? Your credit rating: The lower your credit rating, the higher your interest rate. It’s smart to work on raising your credit score before making any large purchase. You are entitled to request a free copy of your credit score from all three credit agencies on an annual basis. Check it thoroughly to ensure all the information is correct, no unexplained delinquencies are noted, and any open issues are resolved. Anything less than an excellent credit rating will cost you more money in interest than necessary. The term of your loan: A standard car loan has steadily crept from 60 months to an increasingly common 84 months over the last few years. Simply stated, the longer it takes to pay off your loan, the more money you pay in interest, which increases the overall cost of the car. It seems that most buyers are more concerned with negotiating a specific monthly payment rather than the total price of the car. They have room in their monthly budget for $300 and not a penny more. Kudos for being budget conscious, but understand the consequences of extending the term from 60 to 72 months simply to create a lower payment amount. An additional year of $300 payments plus interest only increases the total cost of the car. Another consideration is the length of time you plan to keep your car. Will you be ready to trade it in or sell it in 3 or 4 years? How much equity will you have accumulated, especially if you didn’t make a large down payment? Cars generally depreciate 22% in their first year and the longer the term of your loan, the longer it takes to build up equity. While monthly payment negotiations could very well put you in the driver’s seat of your ultimate dream car, it might not be the most financially sensible approach. It’s important to understand the choices, the alternatives and their long-term effects on your wallet. Going into any purchase with the knowledge of how it works and what your options are makes you a better consumer and a smarter decision-maker.